Do you know where your IELTS test can take you? Attend the British Council IELTS Fair 2019 and learn more about how you can access global opportunities with IELTS. The IELTS Fair is an annual event by the British Council that aims to provide the information you need to study, work or live abroad. 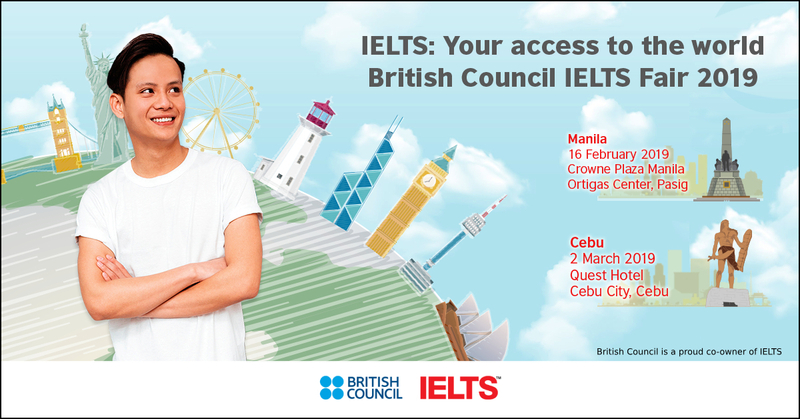 This year's theme, "IELTS: Your Access to the World", highlights IELTS as the world's most recognised English Language test for overseas higher education and global migration. This event brings together review centres, immigration consultancies, recruitment firms, and education agencies who are part of British Council's network of partners. This event is free to the public. Seats for the IELTS Workshop are on a first-come-first-serve basis. *Road To IELTS is an online preparation course exclusive to British Council IELTS test takers. The Last Minute version nine tutorial videos from IELTS experts, 100 interactive activities, and two practice tests for each of the four skills.